SMILE if you remember these? I used to love my little xylophone. As a toddler it was just about banging on the metal pieces because it made a sound. As a young child it became about trying to play Twinkle Twinkle Little Star. As I grew older and the bent metal squares turned into a challenge, it was about trying to find the true melody of a bigger song and do it faster. Eventually I put the xylophone aside for a piano and now I follow music and use my fingers instead of a mallet to find the melody. 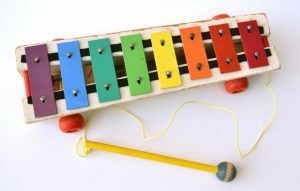 Yes we grow up and grow out of certain things but the xylophone always makes me think of my old house growing up and brings a smile to my face as I think about pinging out melodies from the little bent metal squares held on by rubber nails and pounded with a wooden mallet. As we set out for our day, let’s put a spring in our step and a melody in our heart. And when life hits us with a wooden mallet, instead of getting bent out of shape, let’s try to ping out a sweet little song. This entry was posted in devotional, inspirational, motivational, spiritual on October 12, 2016 by Deanna Young. THERE IS A SMILE THAT COMES OVER ME WHEN I READ THESE WORDS OF MY PRECIOUS DAUGHTER. I COULD NOT BE MORE PROUD. SHE IS AWSOME. SHE IS ONE OF THE MOST CARING PERSON. I LOVE YOU DEE .